Photo courtesy of Sierra Lutz/ISLAND WAVES Sculptures by Martha Whittington, currently featured in the Weil Gallery. The Weil Gallery showcases an interactive sculpture experience. On Nov. 5, the TAMU-CC Art Department debuted a new exhibition in the Weil Gallery that featured sculptor Martha Whittington. “Line of Sight II” is the second installment of this particular exhibition and will be featured in the Weil Gallery until Dec. 7. Whittington is an Atlanta-based sculptor and educator who actually has some unique ties to the Island University. She used to work with Margaret (Meg) Aubrey, assistant professor of Art, at the Savannah College of Art and Design. Whittington presents a wide variety of experience and insight with her art work due to her background in not only fine art but also graphic design. Her experience as a graphic designer continues to influence how she views gallery spaces and structures her work. “My graphic design training. … You can’t escape it,” said Whittington. “When I’m looking at a space for my work, I’m really using the design principles that I learned in design, and I have you go in this space and it is very directional, like reading a book. So, the work really is working from left to right when you come in the space. 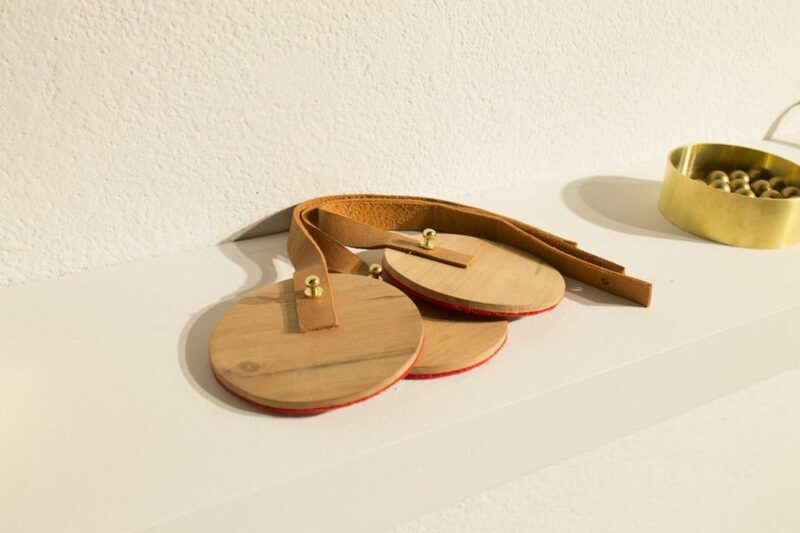 Whittington’s current work that is on display in the Weil Gallery is a focus and study of brass and measurement as well as surveyor’s and their tools. Sculptures by Martha Whittington, currently featured in the Weil Gallery. “The work in your space, in your gallery, is about measuring,” said Whittington. “It’s about place making. It’s about the gallery itself and how it can become a landscape. It’s about the tools that I use to define your space and they’re all related to surveying. The brass I now understand, working with it, what a technical material it really is, that’s why it’s a scientific material. Properly defining the space that viewers will be looking at the work in is very important to Whittington. She values the experience of art and has showcased that through various exhibitions in the past. 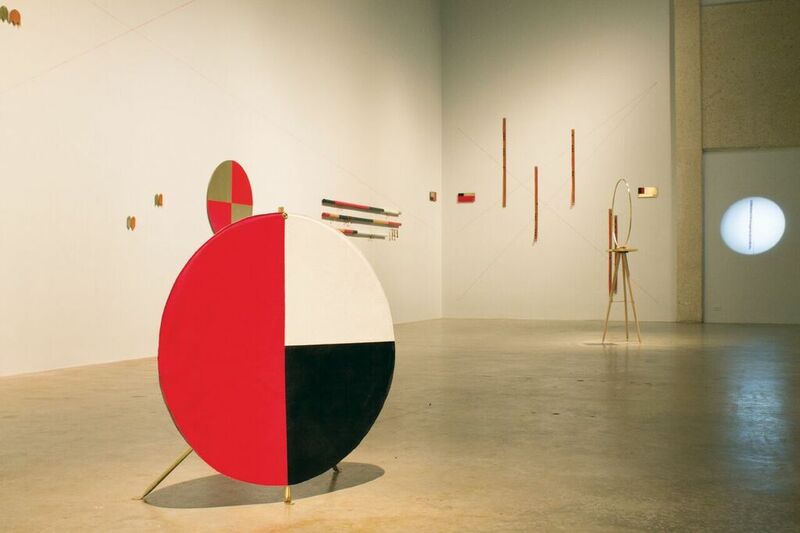 This collaboration was born out of the interest Whittington had previously taken to machinery and having multiple galleries focused on kinetic work. She became addicted to activating the space of her art. After a brief break from pure kinetic work, Whittington began to explore the idea of how humans interact with and become the machines they use. Smaller sculpture from “Line of Sight II” by Martha Whittington. “With my interest in machinery,” said Whittington, “.. I started thinking about machines and how I’d used them in the past, but also how machines had helped shape all of us as makers, as engineers, as mechanics. And I was reading William Morris, who was a leader in the arts and crafts movement, and he wrote extensively about how the machine had taken over the artisan, the coppersmith, the potter — things were being mass produced — and I started thinking a lot about how we have become kind of in that: Operating the machines and becoming machines ourselves, the repetitive task every day. “So, to activate the space, I worked with a local dance troupe and I didn’t want dancers that looked like dancers. I wanted dancers that were everyday people. Even a differently abled dancer who performs in a group in Atlanta called Full Radius and they all dance using chairs with fully abled people. The set I built for this — it was … always active. My dancers came once a day for three months and performed these tasks throughout the space. There was also music that accompanied it. It was composed using mostly acoustic instruments. Kayla Massey, senior Art major and Art History minor, was one of the many students in attendance to Whittington’s “Artist Talk” and “Line of Sight II” gallery opening. Massey took special interest in Whittington’s performance art due to recent research she has been doing herself. “I’ve been looking at instillation art a lot recently,” said Massey, “and especially in combination with performance art. So, I think that her (Whittington) work, because it incorporates both elements of performance and instillation, because she thinks so carefully about how she installs it, I think it’s nice to see not only that in my research, but in practice. Overall, Whittington hopes that students will take inspiration from her work and that ultimately they will see that handmade works are really beautiful and to never be afraid to express themselves in a variety of artistic ways. To learn more about Whittington or see more of her previous installations, please visit her website.